I was able to get the instrument cluster back in this morning. To re-attach the speedo cable, I pulled the other end off the counter switch. Then when I got everything stuffed back in, as I was re-attaching the cable to that box, the threaded top portion broke off. So I'll order a ROW cable and delete the switch. So the control pressure is incredibly high. 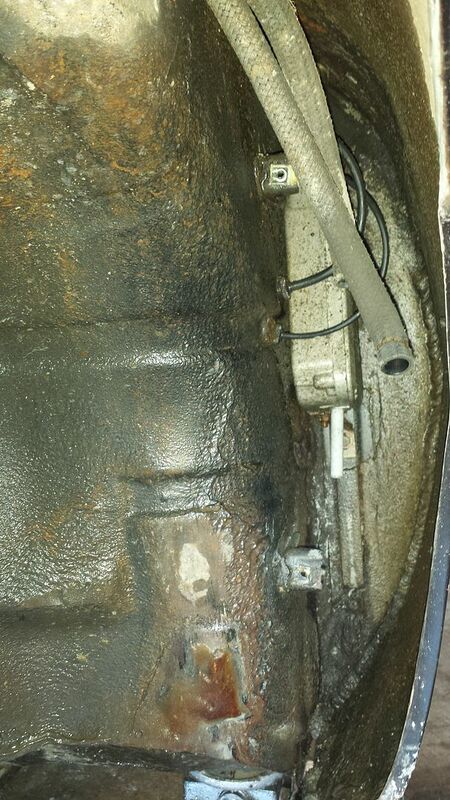 That reading was with the gauge valve open, fuel pumps running but ignition off. I didn't start the car to get warm readings. Yesterday I finally received the make-up silicon hoses the vendor promised so I got in the drivers side wheel house to replace those canister vacuum hoses. That was fairly straight forward but I did discover a rip in the bottom of the charcoal canister and confirmed that wasn't air tight by covering one port and blowing into the other. So I sealed that with some RTV after cleaning everything up. 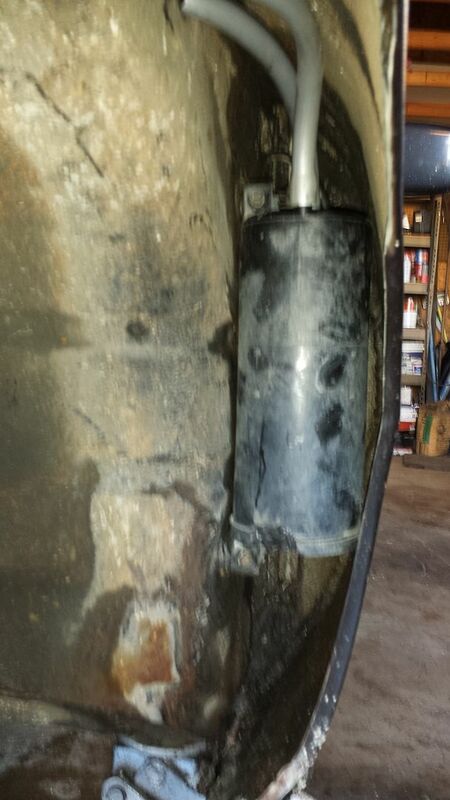 I didn't find any rust in the fender well except for an area just beside the tire and to the rear. I suspect the driver side wish bone on this car failed, the wheel lodged to the rear, tore a hole in the canister and bent the lower rear section of the wheel arch. The wish bone on that side is newer than the passenger side. Anyway, with that done, I went ahead and put the rocker covers back on after figuring out those must slide on front to back to get everything nested. It also helps to clean the backside of those covers with some Amour All to get them slippery. Started the car up and went for a quick drive. The brakes were still spongy so when I got back I bled them again and got a few more bubbles out of the lines. Onward! It was a rip in the lower edge. Definitely from something striking it. 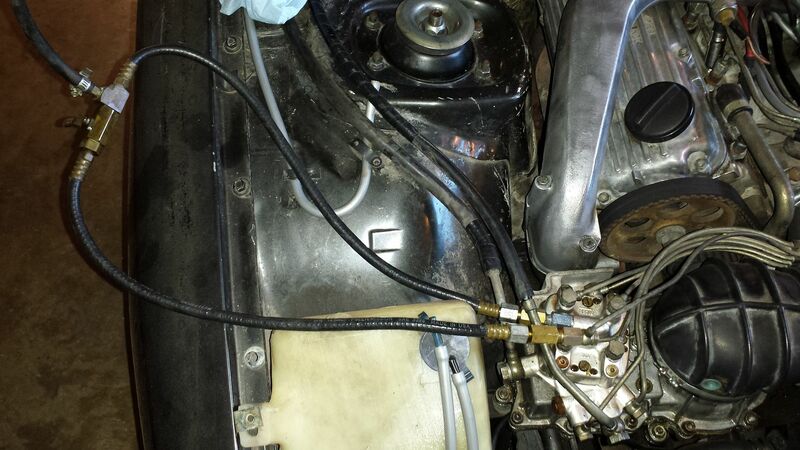 All the vent hoses on the fuel tank are in good shape. Several months ago I replaced the tank and took a good look at those hoses. Hard to tell from the pic what the damage was, its blurry and already repaired. The hoses being in good shape makes it worse, you know they're capable of holding pressure. Not saying that was the problem with your canister, hence the "if". For future reference, if it was holding pressure in the system, I would check the hoses for blockage & the check valve functionality. After a week or so wrestling 914 transmissions, I was back on the 931 today. 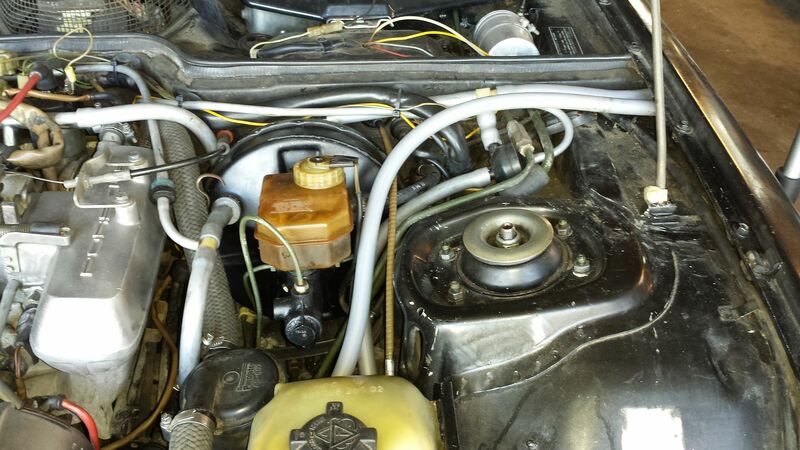 First on the list was to replace the speedo cable. Pretty damn cold this morning so I started the car up and put the heater on high to warm the interior. I wasn't going to be cracking any cold plastic parts! Pulled the steering wheel, got the instrument bezel out and disconnected the cable. I pulled that out of the firewall and I'm ready to install the new cable. Next time I'll remember to attach a string to the old so I can pull the new through. After fishing the new cable through the bowels of the dash, I'm digging the OXS box out of the engine compartment. That requires loosening the AOS to get it out. Then I got the car up on jacks and pulled the driver side front wheel. There's a tiny piece of wire holding the end of the cable in the dust cap so snip that and pull that joker out. Slide the new one in and wrap a piece of small gauge wire around the end. Done. Several years ago my racing buddy gave me some lowering springs and I'm thinking "what the hell" I'm going to give those a try. Those are orange, shorter than OEM, much thicker and have HD-2 stamped on them. I'm going to assume 200 lb. Weltmeister. Anyway, I had the jacks under the front, dropped the sway bar ends and used my floor jack to compress the struts under the control arms. It didn't take long to get the springs swoped out and everything back together. Note that you've got to be careful seating the lowering springs into the top hats as there's more space than with the OEM. Before changing the springs I measured about 6" floor to bottom of rocker on all four corners. 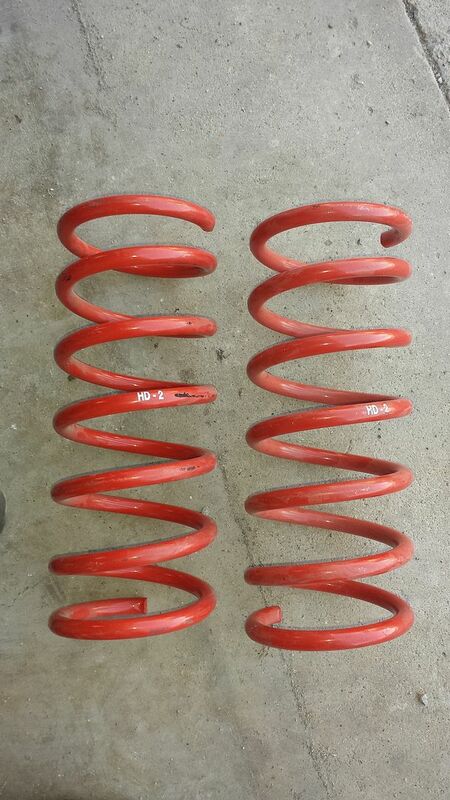 After changing the front springs the front rockers are down to 4". Quite the difference but now the rear needs to come down. So I move to the back, place my jacks, pull the wheels and use a large breaker bar to loosen the height adjustment nuts on the trailing arms. Once that's done, I take the car for a quick test drive and there's a real difference in ride. The front is much stiffer but the rear is still sloppy. When I get back in the garage and measured, the front is 4 1/2" and the rear is 5". Pretty damn good. I noted that the exhaust pipe just downstream of the wastegate is only about 3" off the ground and I've got a clamp there I need to spin. This car won't be going over speed bumps anyway. 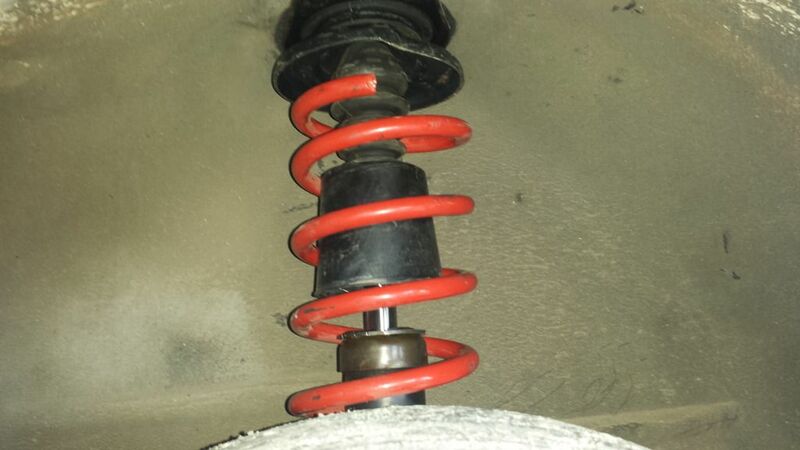 4 1/2 inches on the front is too low for 200 lb springs and you are probably experiencing some bump steer. I've been devoting my garage time to the 914 race car for the last two weeks. Swoping the transmission in that beast with mixed results. The last two nights however I decided to give the 931 a little brake love. 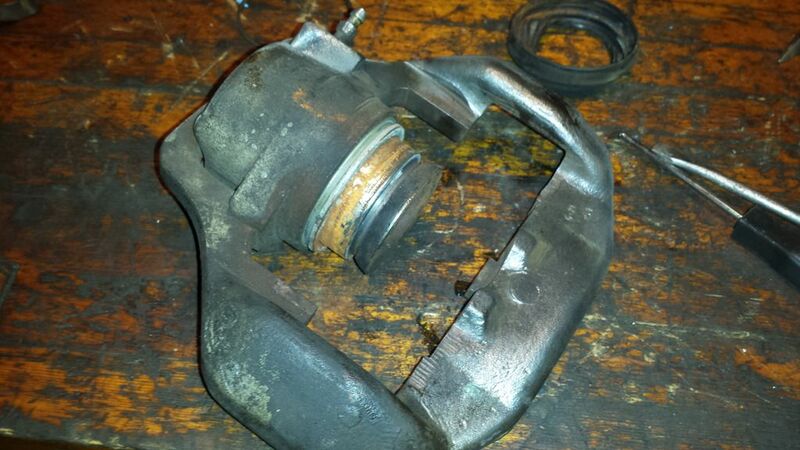 I had ordered front caliper rebuild kits, pads and hoses several weeks ago with funds from 914 parts sales. 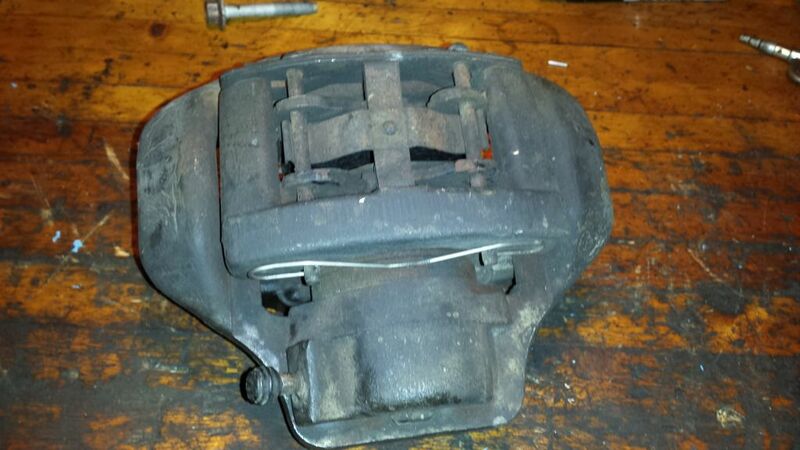 I've rebuilt calipers before so this was mostly routine. 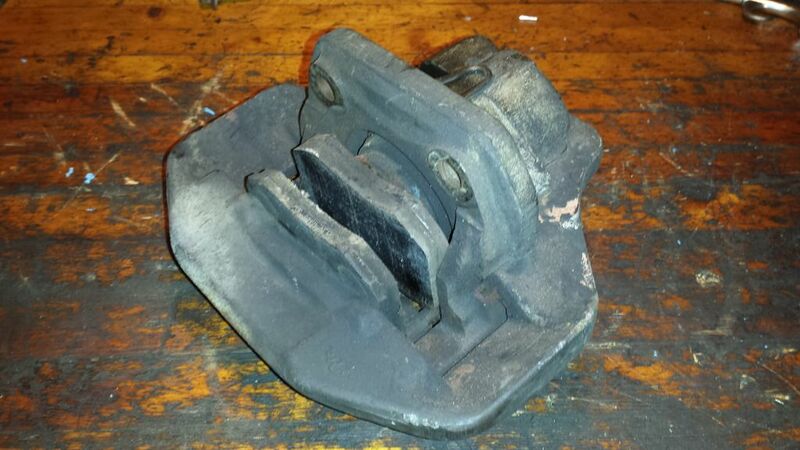 When driving the car, I felt the front brakes were doing their job but the drivers side was hanging somewhat closed as evident from excessive pad dust. I started with what I thought was the better side, drivers; but when I clamped the piston head in the vice and extracted it from the bore - wow, a lot of junk in that cylinder. 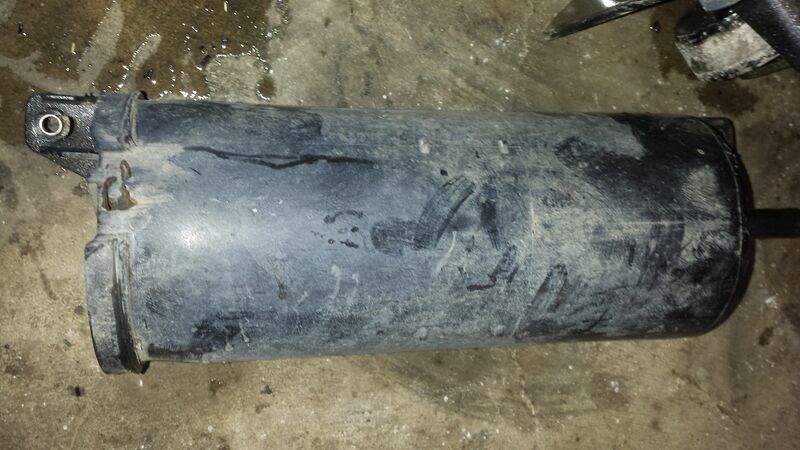 You can see from the photo the corrosion under the dust boot but there were deposits in the bore below the inner seal. I was able to clean all that up with brake cleaner and using a soft wire brush on a Dremel. 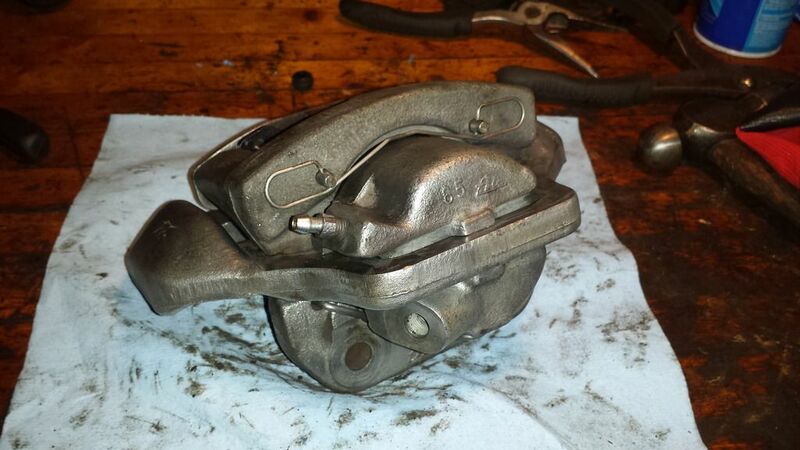 Then I took all the pieces to the bench brush and got all that brake dust and surface rust off. 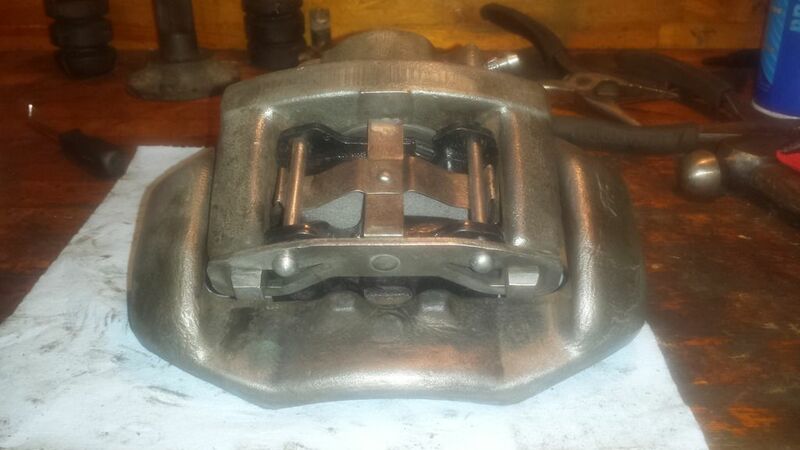 Put the new inner seal in, pressed in the piston and re-assembled. Looks much better. Last night I did the drivers side and the piston was much harder to extract. So that was definitely hanging up. 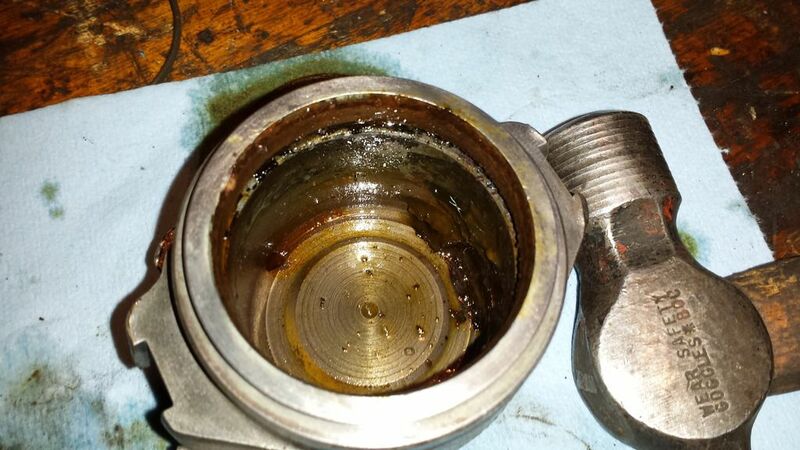 Not as much corrosion or deposits in the cylinder but the inner seal was really bad. Both sides are back on with new hoses but I'll need to bleed. After seeing the fronts condition, I'm thinking I really need to do the rears also. I was side tracked for a while by a '87 924S Craigslist car that I couldn't pass on. That one was relatively easy to get on the road and the 914 took up some time following. So just minor things have been done to the 931. 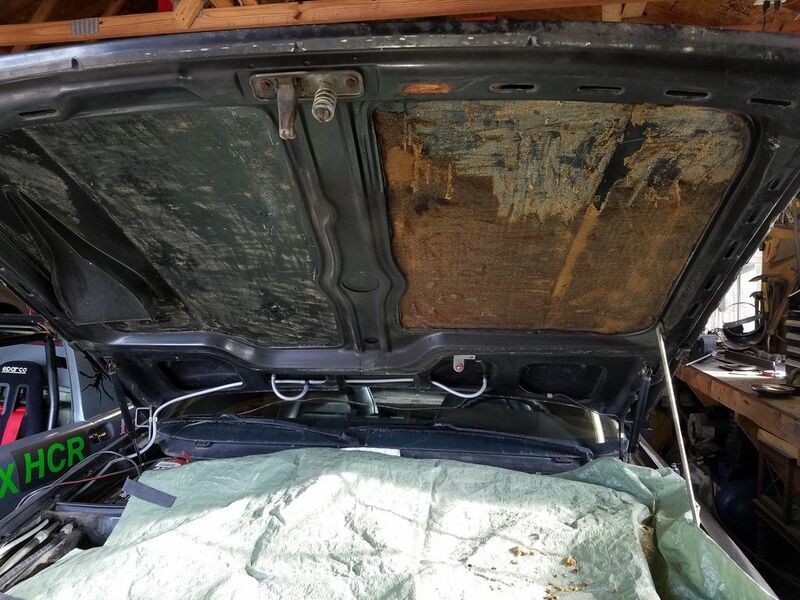 I scraped off all the deteriorating foam under the front hood. That's some nasty adhesive the factory used there. Goo Gone and a dull scraper got the majority. I still start the car weekly and usually take a quick run down the road. 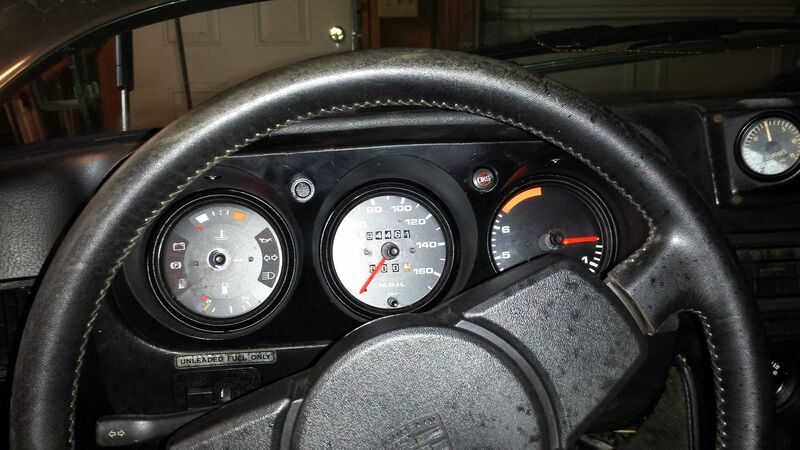 I've got the 15" phone dials off the '87 924S on it and I like that look with the 931 lowered. Yesterday I pulled out the original front seats which were split and mushy. Then I vacuumed the carpets real good and painted them with gloss black interior spray. I'm really liking that product for sprucing up interiors. 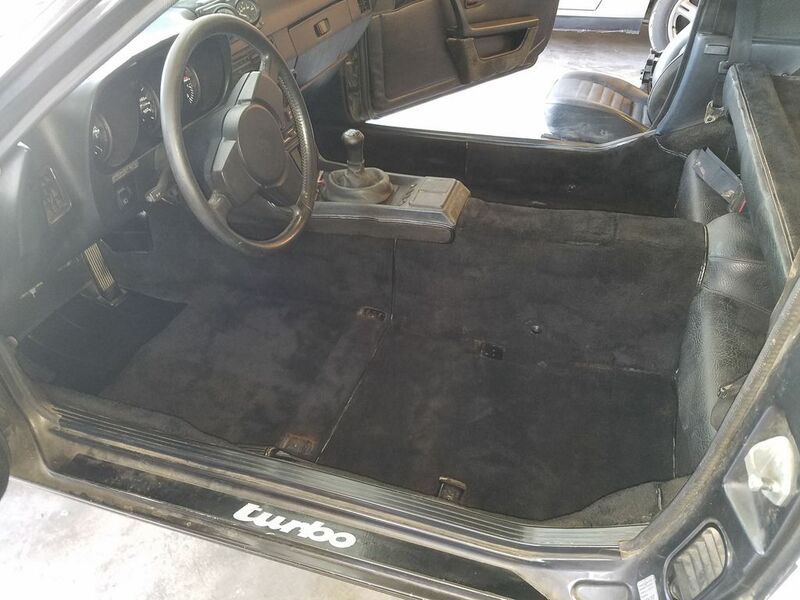 I didn't pull the carpet, just masked off the console, rear seats, dash etc. Eventually I'll pull the console and paint it also. 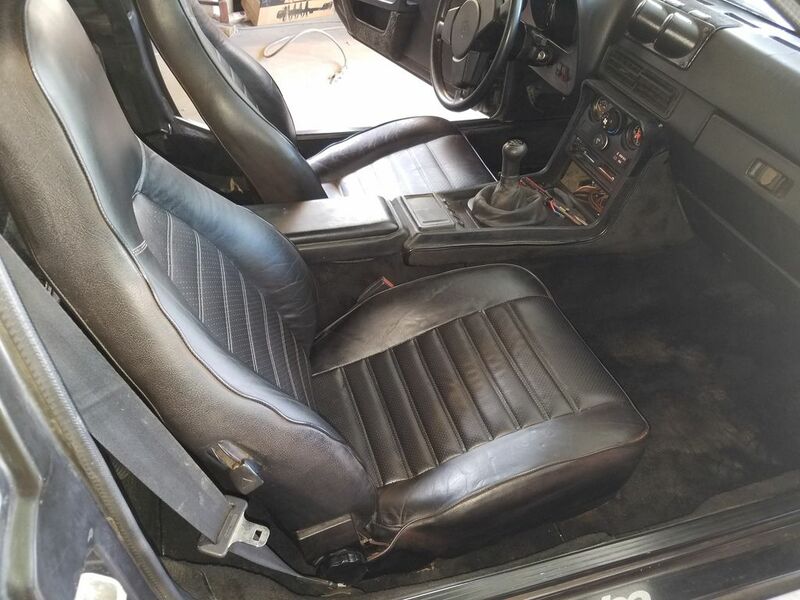 I had purchased some nice 944 seats from Just Joshin' parts back in the winter and transferred the original seat rails to those. 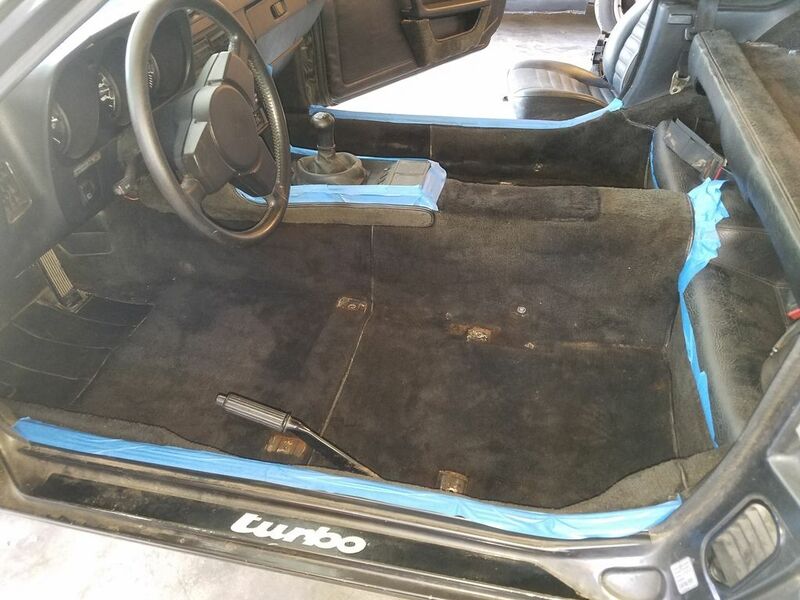 Those two tasks really changed the interior appearance. The seat foam is nice a firm and now I don't feel like the seat is shallowing me up! 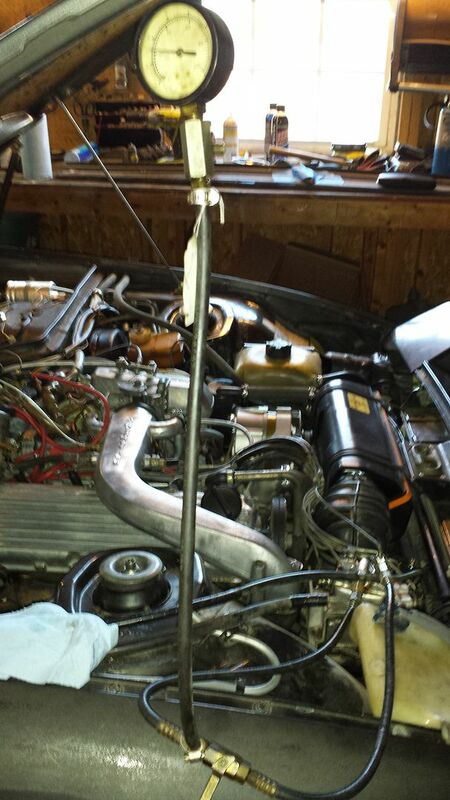 My car doesn't have the check valve shown in this pic, and I don't see it in the parts catalog. Anyone know whether it should be there or not? Seems like it might interfere with component operation. . .don't some bits on that line need vacuum, and some need boost? Are you referring to the small check valve that's off the tee on the smaller hose Rasta? I was pretty methodically replacing all the vacuum components as I was replacing the old hoses, so that would have been there when I got the car. Well, I'll tell you brother, it is not in the parts catalog, and I don't think it belongs there. The WUR needs a boost signal, and timing retard needs vacuum, as does the vacuum limiter. With a one way check valve, components on that line aren't going to work right.